This recipe comes from a good friend. I’ve had it tucked away in my recipe box for years and never made it until last week. I changed a couple of things, the first being what vegetable I used. Originally this fifth recipe in the 52 Week New Recipe Challenge included sugar snap peas, which are not a favorite, along with the asparagus. I just omitted them and add a bit more asparagus. My girlfriend used cooked, shredded chicken but I just cut boneless, skinless chicken breasts into 1-inch pieces and sautéed in olive oil until golden and cooked through. The cooked shredded chicken is a great option if you have leftovers or for a quick dinner on those busy weeknights. If you choose to use the sugar snap peas, use one package of frozen peas that you have slightly cooked. Other vegetable options include sliced carrots, peas, sautéed spinach or whatever you like. In a heavy saute pan heat olive oil and cook chicken pieces until golden and cooked through. Remove to a plate. In a separate pan cook pasta in salted water. Drain, reserving half cup of the pasta water. Meanwhile, in a large saucepan heat cream, butter, veggies and chicken. Add pasta water to make sauce. Add pasta and toss together. Add salt and pepper to taste. Serve with salad and garlic bread, if desired. Depending on how you like your asparagus, you may want to slightly pre-cook it. 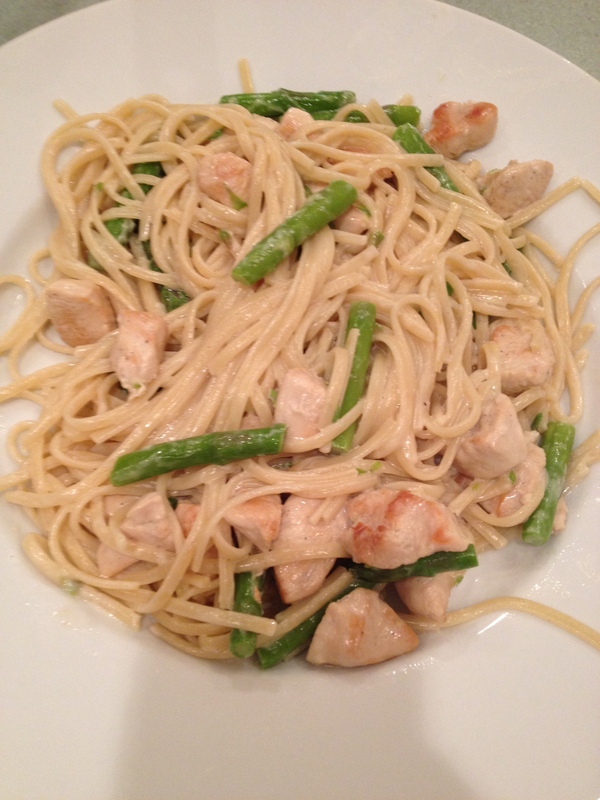 This entry was posted in 52 Week Challenge, Chicken, Entrees and tagged asparagus, chicken, dinner, easy meals, linguine, olive oil, pasta, shredded chicken, skinless chicken breasts, sugar snap peas, vegetables. Bookmark the permalink.